Luca is still encircled by mighty 16th century walls. Lucca is a genteel, unjustifiably overlooked city set into plains that wash up against the foothills of the snow-capped Apuan Alps where Michelangelo mined his marble. The choirs of its Romanesque churches once rang with the young voices of future composers Puccini (of operas La Bohème, Tosca, Turandot, and Madama Butterfly fame) and Boccherini (of Minuet #13 fame—still my favorite piece to play on the violin). The church of San Michele in Foro.A teenaged Puccini warbled in the choir where here father was organist: just up the street from their house in the church of San Michele in Foro, rising on the site of Lucca's ancient forum at the very center of town (leading many visitors to mistake this church for the town's cathedral). San Michele's lofty façade is distinctive of the local Romanesque style, a towering stack of open arcades kneeling on rows of midget, mismatched columns. The similar stack of 13th century façade arcades on the Duomo di San Martino cathedral hang above a portico packed with medieval carvings and sculptures. The cathedral sacristy preserves Lucca's great art treasure, Jacopo della Quercia's masterly early Renaissance tomb of Ilaria Guinigi, a tragic beauty who married the town boss before dying at 26. The cathedral's religious treasure is the Volto Santo, a time-blackened Christ that legend holds was carved by Nicodemus himself (it's probably a 13th century copy of an 8th century Syrian work). It was so famous in the Middle Ages that it even gave rise to a fictional saint in some southern French villages, where—reports from pilgrims coming home from Italy apparently having gotten a bit garbled—they built churches dedicated to that famous Italian "Saint Vauduluc" (a corruption of the French for "The Santo Volto of Lucca"). 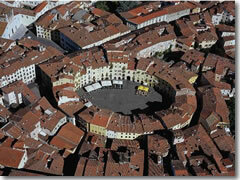 Piazza Anfiteatro in Lucca, TuscanyThis ancient town still preserves its Roman street plan—including Piazza Anfiteatro,an oval of medieval buildings grafted onto the ancient amphitheater's remains—within a circuit of massive 16th century brick bastions. The broad, 16th-century ramparts girding Lucca's historic center were turned into a narrow strip of city park by Princess Elisa Bacciocchi, Napoléon's sister, whose regency ended Lucca's long centuries as an independent republic. At 4:30pm, locals line up at the Art Nouveau take-out window of Amadeo Giusti, Via Santa Lucia 18-20, to snack on Lucca's best pizza bianca (the "white pizza," a.k.a. focaccia, with no sauce or cheese, just a little olive oil and rosemary). They then take it on their evening passeggiata stroll along shop-lined Via Fillungo, popping into historic 1846 Antico Caffé di Simo at no. 47 for an espresso or Campari-soda. Planning your time: You can tour the best of Lucca in 2–4 hours—and could, conceivably, pair it up with Pisa to make a very full day trip out of Florence (but make sure you leave really early in the morning). Visitor information in Lucca: The Lucca tourist office is in a littel building standing on its own in Piazza Santa Maria (tel. 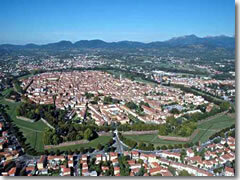 +39-0583-442-944, www.lucca.turismo.toscana.it). How to get to Lucca: Lucca lies on the Florence–Viareggio train line, with an average 1–2 trains from Florence hourly (80–105 min.). 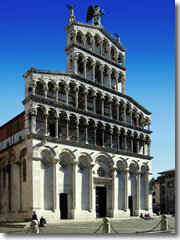 It's also a short hop from Pisa (1–2 per hour; 27 min. ), which a major stop on the main coastal rail line north from Rome (total time from Rome, via either Pisa or Florence: 3:30–3:45). Rent a bike: Luccans far prefer biking to driving, and you'll find few cars within the walls. Rent your own wheels for about €3–€4 per hour (€15–€20 per day) at one of several bike rental outfits located on Piazza Santa Maria, such as Biciclette Poli at no. 42 (www.biciclettepoli.com). Near Lucca: Pisa (27 min. by train), Cinque Terre (90–115 min. by train via Viareggio and La Spezia), Florence (80–105 min. by train).